in the latter capacity, he died at Constantinople, March 3, 1843. Pa., June 8, 1813. He accompanied his father on his cruise against the pirates in 1825, and for some time was a midshipman in the Mexican service. He entered the United States Navy in 1829, and after being employed on the coast-survey from 183Ö to 1841 he became lieutenant, and served till 1845 on the Mediterranean and Brazilian stations, afterward returning to the coast survey. At the commencement of the Civil War he was appointed commander of the Powhatan and ordered to Pensacola; but afterward he was placed in command of the mortar-flotilla, with which, under Farragut, he successfully bombarded the forts of New Orleans. In 1863 he was placed in command of the Mississippi gunboats and rendered such signal service in the siege of Vicksburg (a. v.) that he was raised to the rank of rear-admiral. Transferred to the North Atlantic squadron, in December of the next year he bombarded and silenced Fort Fisher (q. v.), and in January, 1865, the place was captured by the combined action of the military and naval forces. At the close of the war Porter was made vice-admiral, and in 1870 succeeded Farragut as admiral. He died at Washington, D. C., Feb. 13, 1891.
of discussion for more than twenty years, and in 1886 he was restored to his rank of colonel in the United States army. He died in 1901. Porter, Horace, an American soldier and diplomat, was born at Huntingdon, Pa., April 15, 1837, and educated at West Point. He served during the Civil War as chief of ordnance in the army of the Potomac and in the army of the Cumberland, and as aide-de-camp to General Grant in the last year of the war. He also was Grant's military secretary for a number of years and, later, his private secretary. 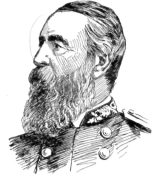 He reached the rank of brigadier-general during his career in the army, from which he resigned in 1873. In 1897 he was appointed ambassador to France a position which he filled till 1905. Porter, Jane, author of The Scottish Chiefs and other works, was born at Durham, England, in 1776, daughter of an army-surgeon who died soon after her birth. She was brought up at Edinburgh and London, and made a decided reputation in 1803 by Thad-deus 0} Warsaw, a romance which was followed by her most famous work, The Scottish Chiefs, in 1810. This work has a remarkable interest for youthful readers, and had the merit of inspiring Sir Walter Scott to write Waverley. She died at Bristol, May 24, 1850. Porter, Noah, president of Yale College, was born at Farmington, Conn., Dec. 14, 1811, and graduated at Yale in 1831. After teaching for a number of years and taking a course in theological study, he became pastor of a Congregational church at New Milford, Conn., and afterward at Springfield, Mass. In 1846 he was elected professor of metaphysics and moral philosophy at Yale, and, after filling that position for 25 years, in 1871 he was chosen president of the institution, a position which he held until 1886. He died at New Hal7en, Conn., March 4, 1892. Among Dr. Porter's numerous works are The Human Intellect, Books and Reading, Elements of Intellectual Science, Elements of Moral Science and an edition of Kant's Ethics. He edited Webster's Unabridged Dictionary and Webster's International Dictionary.